Water is not only the world’s most precious resource, but also the basis of all living things. GROHE and BWT, Europe‘s leading water professionals, represent safety, hygiene and the highest quality standards. We have combined the expertise of our two companies to deliver a completely new water experience. Tap water is now transformed into pure refreshment, using the innovative GROHE Blue® product range. GROHE Blue® filters the water with technology supplied by BWT and then cools it down to the ideal temperature for you to enjoy, providing still water with fine bubbles or effervescent, sparkling water straight from the tap. BWT’s global innovation offers all water gourmets a refreshing tasting water, filtered by BWT’s unique, patented Mg2+ technology and enriched with magnesium. Just perfect for your everyday drinking indulgence. Pre-filtration: Filters out coarse particles of sand and dirt. Activated carbon pre-filter: Removes chlorine, certain organic compounds including insecticides and pesticides. Activated carbon filtration: Bypass water is filtered and purified while keeping essential minerals. Fine filtration: Captures even the finest remaining particles. Our standard 600-Litre high-performance filter comes with every GROHE Blue® starter set, and replacement filters are available in three sizes - 600L, 1500L and 3000L. Every GROHE Blue® filter cartridge uses a five-step technology to remove all substances from tap water that impair its taste. 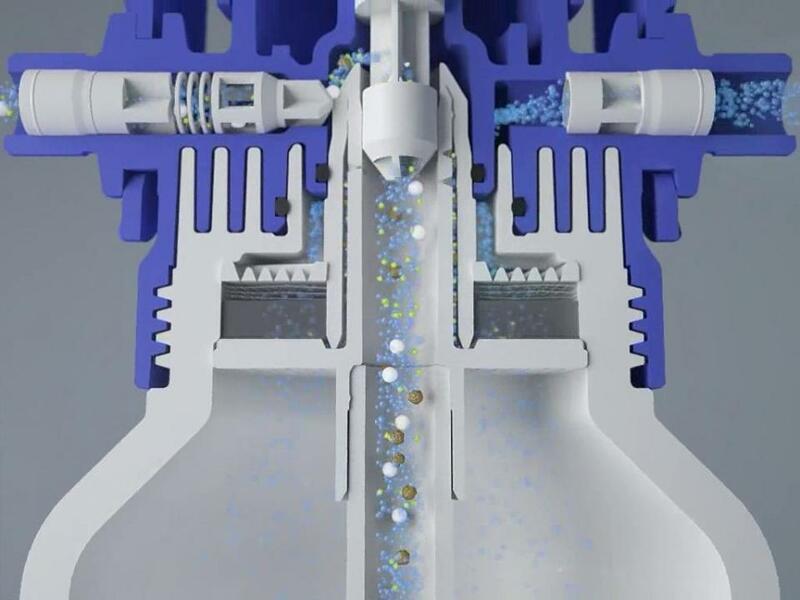 Carbon filtration removes chlorine while a high-performance ion exchanger reduces limescale and heavy metals, leaving you with untainted, odour-free drinking water with a pure, fresh taste. Ideal for soft water areas, the activated carbon filter improves the tast by removing chlorine and metal substances but does not filter out carbonate hardness. Enjoy additional health benefits by choosing the magnesium+ filter model. It uses our five-step filtration process and also adds magnesium to the water. Something of a tea and coffee connoisseur? Than this is the option for you, with added magnesium delivering the best-tasting tea and coffee possible. Great-tasting GROHE Blue® costs just one fifth of the price of premium waters. You reduce your energy consumption and avoid huge quantities of plastic waste. Water is the most fascinating of all the elements on our planet. And water preferences can be as individual as taste in design. With GROHE Blue®, we can cater to your exact tastes. Do you like your water still, lightly sparkling or sparkling? Filtered directly from the fitting in your own kitchen? Your wish is our command. Do you like your chilled drinking water still, medium or sparkling? The choice is all yours. First the water is filtered to remove impurities. Then it is chilled to create that mountain-fresh taste. And a simple twist of the handle lets you choose the carbonation. For people who prefer still water only, GROHE Blue® Pure is the ultimate solution. Better tasting than tap water, better for the environment than bottled water, and much more convenient for you, GROHE Blue® Pure offers drinking water of ultimate purity. © 2019 Grome Marketing (Cyprus) Ltd.